A general whinge about deficiencies with the preinstalled applications on the slider, which some might consider self evident – see Kenny’s comment below. Anyone with suggestions about what I should be installing instead let me know. 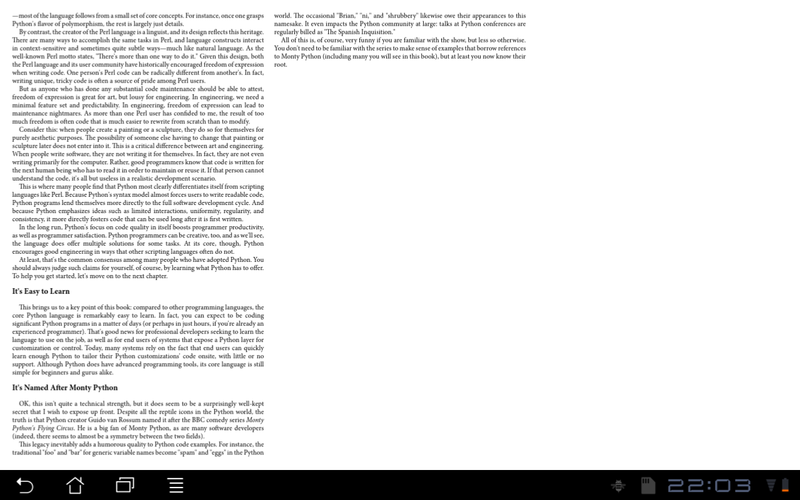 At the moment I have installed Aldiko, which transforms the slider into a decent, but expensive, epub reader. Awful application design decisions grievously, perhaps mortally, wound a fundamentally good hardware concept. It remains to be seen whether market apps can fill the gaps left by the preinstalled offerings – Aldiko is a good start. My ancient eeePC701 with its 7″ screen and Linux is more useful for getting work done than this thing. Last year, influenced by my excellent experience of my eeePC 701, and somewhat whimsically, I put an ASUS Slider Android tablet on my Christmas list. Be careful what you wish for, the old saying goes. I have had mine since Christmas, and have attempted to find a use for it. This is my review of my experiences with it. The Asus slider is apparently targeting people who want to make serious uses of the device, rather than teens wanting a portable media player. As a lawyer I feel competent to comment on its use in a professional setting. However, please note this review is strongly biased towards whether or not I can use the device to assist in getting my work done. In different contexts you may have greatly different experience. I had toyed with the idea of this replacing my ancient eeePC701. Since getting the Slider I have used my eeePC 701 probably 10 times as often for doing work related stuff. This was largely typed on the slider itself, with a lot of editing on my desktop. The web browser is excellent, especially compared to the awful one which ships with the HTC Desire. The controls are intuitive, it is possible to open multiple tabs (there is a maximum number allowed but it still allows a lot of tabs) and to open them in the background. The screen is large enough to get a good view of the pages, with enough text. The only way the Slider can connect to the internet is through a wireless router. A LAN cord cannot be plugged in, nor (apparently) will it accept USB LAN dongles. I have disavowed wireless routers because it is a never ending security headache and one that I would prefer to avoid. As such, my Slider doesn’t get a lot of Internet use, so there may be other issues that I haven’t noticed. The keyboard seems okay to use, even when typing at a relatively brisk speed. The slider can rest comfortably on my lap although the right shift key is very small and I am constantly making mistakes when trying to type with it. The slider doesn’t come with an inbuilt pointing device. The on screen keyboard doesn’t show alternative characters so finding an apostrophe is difficult. The file manager application is welcome, if somewhat tedious. The absence of paned windows means that moving any files around is laborious – select the files you want to move, select copy, navigate to the new directory (by going up the directory tree, then down), select paste. I tried to copy over all of my electronic books, but the readout seemed to only indicate 100 were being copied. The stupid thing automatically downloaded a new firmware the first time I started it up and connected to wifi (installed with 3.1). It did not ask me whether I wanted it to do this. Fortunately the upgrade (it asked before installing the update) did not cause me to lose any data. The only reason I noticed was that there is a small green arrow in the menu bar to indicate download. The Slider’s weight is noticeable, but not prohibitively heavy. Video, movie studio, presentation slides, spreadsheet, email. Never tried them. Suspect that it will be not much use for presentations given it lacks standard video outputs (it does have an HDMI connector though). Also didn’t try kindle, press reader, zinio, mycloud, mynet – anything that required me to set up an account. A quick look at the spreadsheet indicates the same lack of basic thought that went into the word processor – can’t navigate cells by the arrow keys, to enter anything you need to tap the “fx” box, type what you want in (if using the on screen keyboard, tapping for the alternative keyboard every second letter to get things like =, +, 0-9) then tap the “ok” button. You heard me right – hitting the enter key does not add the edit to the cell. Astoundingly, no member of the team that worked on this app has, apparently, ever actually used a spreadsheet. The gallery seems harmless enough, although the “play” feature apparently only has one mode – called “slow, annoying pan and zoom”. Would a slide show without transitions be too much to ask? Keep in mind here, that if you want this device to read trashy novels on your summer holiday, the apps are probably perfectly appropriate. I am reporting on my experience of using these apps to do paid work in my business. * allows me to cut and paste extracts (or, frankly, the whole thing). Alas, it doesn’t. It has two things which will pass as a pdf reader if there is some pdf that you need to read in order to save your life, but it’s not something you’ll want to do often. These are “MyLibrary” and Polaris Office. The natural orientation of the device is in landscape, with the keyboard slid out. This provides a workable stand for the display. However, when you do this the readers simply display one pdf page in the middle of the screen, with about half of the screen going to waste. At this magnification the text is not quite readable in Polaris but is readable in MyLibrary. The failure here is that there should be some way for the pdfs to be reflowed to match the available screen real estate and magnification. Screenshot from Aldiko (not preinstalled), but similar for Polaris and MyLibrary (MyLibrary puts more effort into dithering, so text is more readable, but there is noticeable lag in displaying new pages). See all the wasted space on either side? So far as I can tell, neither MyLibrary nor Polaris Office allow copying extracts from pdf files (or ebooks, or, in the case of Polaris Office, text files(!!)). Charming. Want to quote something from that pdf I have to review? Easy, retype it. Thanks a heap for making my life easier. Neither app allows more than basic navigation. Unlike a pdf reader on a desktop, which will provide a tree like structure of chapter headings to allow direct access to the relevant section, the apps at best allow you to jump to a given page (via a scroll like bar at the bottom). Polaris Office optionally provides tiny (and therefore useless) thumbnails down the side if you’re willing to wait for it to calculate them. On Polaris Office you swipe up and down, while MyLibrary is swiped left to right. MyLibrary takes a lot longer to display a page. It pre-calculates near pages, but the lag is so bad that you can’t just start flipping through a book to find the right section. MyLibrary application was clearly designed by someone who doesn’t actually have a library. I moved across a number of books from my phone then tried to open one of them in the MyLibrary application. Rather than presenting me with a folder interface to navigate, the brainiacs who designed it decided instead to present a sorted list. Fortunately, it doesn’t scan the whole disk every time you open the app, but the first time, there is an interminable delay if you have more than a handful of ‘books’ – which includes every text, pdf and doc file on the device. This means that each ‘readme.txt’ file is in there separately, without being able to distinguish where it is from. If you have books in multiple formats (epub and pdf for example) you can’t tell them apart in the interface. I copied epub and pdf copies of the same title and now they are shown, indistinguishable, in the MyLibrary interface. Aside: I personally have had a hatred of document search interfaces since pretty much the time I was first forced to use one (as part of a document management system my then employer installed). These systems only allow you to access the document you want if you happen to remember its name or contents. Heirarchical systems – ie file systems are infinitely superior, at least for finding your own documents. The main value of search interfaces is to find other people’s documents. This is not the use case on a tablet application. The MyLibrary reader retains zoom level from page to page, but not a vertical offset. So if you zoom so that header and footer aren’t showing, or just to get rid of white space at the top and bottom of a page, the page will be re-aligned when you flip to the next page – giving you whitespace or header at the top, with the text you’re interested in pushed off the bottom. 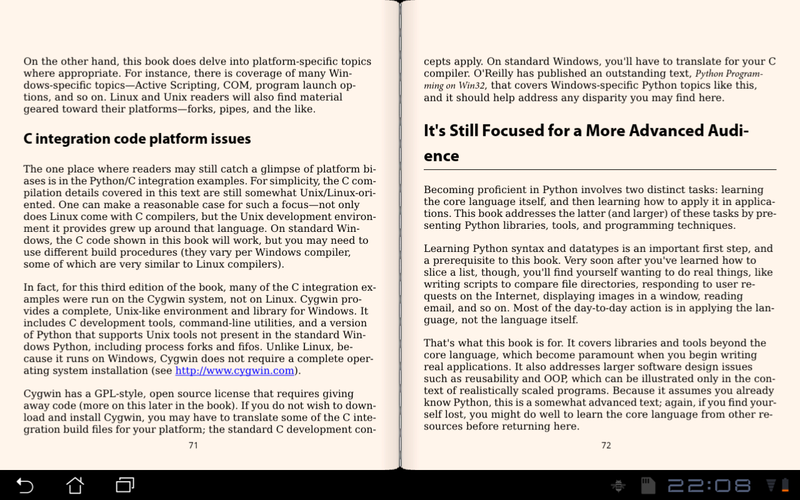 The MyLibrary reader will display pages either in landscape or portrait. However, when in landscape there seems to be no way to put two pages up on the screen side by side – for pdf files, although the demonstration epub format document that ships with the Slider is displayed two pages across in landscape. Given that flipping the keyboard out is an instant stand for the screen this waste of over half the screen is mind bogglingly. Did no one do any testing of the device? I can only hope that this function is hidden somewhere? Along the bottom of the book is a navigation bar. This bar is particularly useful in navigating to a specific page within a document – but only if you know the page number you’re looking for of course. 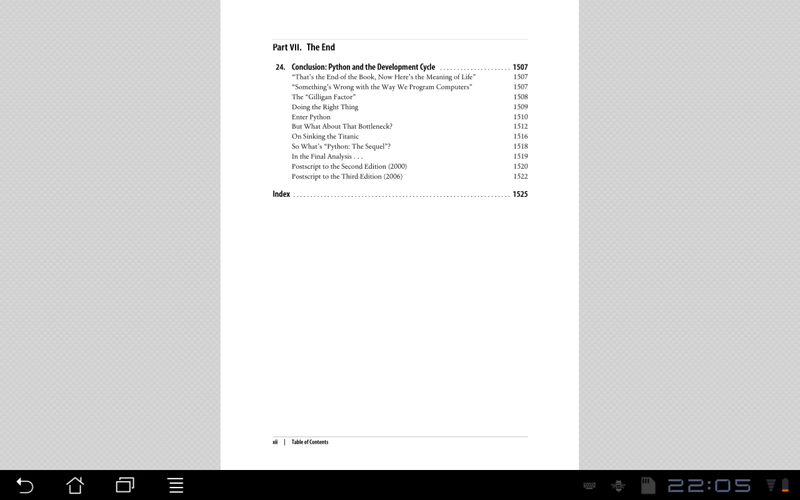 When displaying epub documents, the reader allows you to show two pages side by side (why not for pdfs?). However, to counteract any utility this might provide to you, they enforce font sizes, the smallest of which is big enough to read from the other side of the room (I exaggerate – I couldn’t read it when I got about 1.5 metres away). So, all that unused white space reclaimed by showing two pages on screen? Wow, we could get a lot of text there so people could, like see more than a tiny window on the document they’re reading… or… we could use a large font and throw all that extra space away. Brillant, just brillant. Hint: If I have a document on A4 I print it out two pages to a page and happy read it. Let me do this on a tablet. The screen, admittedly is smaller than an A4 sheet, but the printable area, once margins are removed is actually not much bigger than the Slider’s display. And while I’m at it – make freaking A4 sized netbooks and tablets. All my other stuff is A4, why am I carrying around things which are artificially small? The other morning I was faced with the ludicrous situation of copying an email across as a text file in order to work on it and being unable to either edit it or copy and paste from it. Polaris Office can open, but not edit, text files. So far as I can tell, there is no way to edit a .txt file with the preinstalled apps. If I had an application which could edit text files, nothing fancy, just ASCII text with keyboard shortcuts like ctrl-s and ctrl-z, it would be more use to me than Polaris Office has been to date. That said, I have not attempted to edit any work document on it yet. Polaris Office might best be described as quirky. It is designed to be used without a keyboard and, if you have a keyboard, well, you can use it for typing, but not for commands. It does not offer even basic navigation by keystrokes – ctrl-shift-arrow to select, ctrl-arrow to move per word, ctrl-backspace to delete by word. Selecting text has been cleverly hidden – to use it you double click – in the same place. You can’t click and drag to select. You need to double click to get two selectors, then drag the selectors. Other applications on the device (like the browser) use long click for select. It is only now that I have noticed that there is no icon for copy or cut on the menu. After a day I have discovered how to do this – select, then long click <sigh>. Apparently the only meta key that the editor recognises is undo (ctrl-Z). It has a “redo”, but you apparently need to click the screen for that. Polaris office appears to store its documents as some sort of Word file, although whenever I have tried to open them in LibreOffice, it crashes. I have opened them in Microsoft Word with no problems. Finally, Polaris Office does not do mark up – at least not so far as I can tell. Whenever I have tried to open a marked up document Polaris fails. The great majority of my work with documents involves markup, whether my own, or someone else’s. This renders Polaris Office largely useless for a “professional” such as me. By way of comparison, my eeePC 701 running Linux copes with markup. If you want a news reader you can sign up for an account with Zinio – ahem. In fact, the whole of the Slider seems to be predicated on the assumption that you are connected with the internet via Wifi. In fact, the whole thing just seems like a platform for selling online services to you. Forget that for a joke. The weather widget is beautiful, but, compared to the widget on the Desire, apparently totally useless. It has no forward forecast that I could find, nor pre-set forecasts for other cities. It simply tells you the current weather where you are. Well, thanks, but given that I can use a window, I can work that much out for myself. Like the rest of the apps, setting alarms is a bit tedious – the digital clock in the bottom right hand corner doesn’t allow it. Nor does the “Asus Time” widget, although the analogue clock widget does, as does opening the clock app full screen. The device is apparently fitted with a GPS, but given that you need to use a wireless access point to get the internet to use a map application, this seems a little ridiculous (can’t use it driving in the car for example). Apparently to add events in the calendar app requires either a Gmail account or an exchange server. Absolutely, completely useless to me. What a terrible failure. Pre-installed apps are hopeless, as received from the factory this device is of limited utility for professional use. Installing Aldiko greatly improves the usefulness of this device. Other apps may also improve it. Opposition: Make My Day – wtf? If it is correct that the Leader of the Opposition is channeling the Dirty Harry character, it is a pretty weird thing to go around saying. The quote originates from the movie Dirty Harry. After a gun fight, the “Dirty” Harry Callahan character advances on an injured “punk”, with his revolver drawn. Mr Callahan says to the punk that he doesn’t know whether he has any bullets left in his gun, but invites the punk to find out – “go ahead, make my day”. The punk submits but wants to know if Mr Callahan had any bullets left. He points the gun at the punk’s head and pulls the trigger, demonstrating both that the gun is empty and that he knew it was empty. So, the subtext of this quote, should you ever pull it on someone as a challenge, is that you’re bluffing and you can’t back your challenge up.